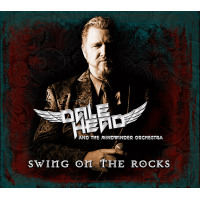 Dale Head is a high-energy singer who doubles on trumpet and makes up in drive and enthusiasm for what he may lack in singularity and polish. 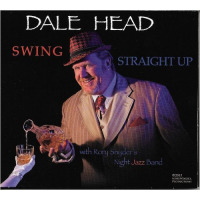 Swing Straight Up, on which Head is backed by Rory Snyder's admirable Night Jazz Band, underlines the singer's strengths (strong voice, an abundance of self-confidence) while serving as a reminder that Head is several furlongs short of his leading role model, the incomparable Frank Sinatra. There's no doubt that Head's heart is in the right place (a blurb inside the album's jacket declares "Support Music in Public Schools!") but the voice doesn't always keep pace with the credo. His phrasing sometimes misses the mark, and whereas Sinatra, for one, was always solidly in control of his pipes, there are times when Head seems to be shouting to make a point. Perhaps that's simply his style, but the lack of restraint does him no favors. A firmer hand on the throttle would be helpful. On a more positive note, it's clear that Head loves what he's doing, and the warmth is contagious. The songs, with a handful of exceptions, are from the Great American Songbook including a pair of classics by Cole Porter ("It's All Right with Me," "Night and Day"), and it is here that the contrast with Sinatra is most apparent, as Ol' Blue Eyes defined both of them and Head is unable to re-create the magic on either (thus entering the ranks of many other successors who have tried and failed). Another of the standards, Rodgers and Hammerstein's "My Favorite Things," has been given a brand new lyric (and manic tempo), while words have also been added to Dave Brubeck's "Blue Rondo a la Turk." Completing the program are three engaging originals by Joel Evans, "Love Is the Name of the Game," "So Close to Getting Close to You" and "No Easy Way to Say Goodbye." The closing number, "Don't Get Me Started," is performed by the ensemble, with crisp solos by trombonist Sandy Hughes, tenor Stephen Herrick and trumpeter Walt Beveridge. Speaking of trumpet, Head designs pleasing statements on "Name of the Game," "Teach Me Tonight" (flugel) and "No Easy Way" (muted trumpet). Snyder (alto) solos on "It's All Right with Me," Beveridge on Jerome Kern's "The Way You Look Tonight," Hughes and pianist James Wrubel on "So Close," alto Antony Pickard on "Come Rain or Come Shine," Herrick on "Georgia," Hughes again on "Night and Day." One last aside: some purists (not mentioning any names) may find tweaking a lyric, as is done on "It's All Right with Me," rather annoying. In sum, a reasonably entertaining session by a reasonably capable singer (and orchestra). Track Listing: It's All Right With Me; Love Is the Name of the Game; Teach Me Tonight; The Way You Look Tonight; So Close To Getting Close To You; My Favorite Things; Come Rain or Come Shine; Blue Rondo A La Turk; No Easy Way To Say Goodbye; Georgia; Night and Day; Don't Get Me Started. Personnel: Dale Head: vocals, trumpet, flugelhorn; Rory Synder: alto saxophone, director Night Jazz Band; Antony Pickard: alto saxophone; Ian Williams: alto saxophone; Stephen Herrick: tenor saxophone; Ryan Tomko: tenor saxophone; Brenda Thompson: baritone saxophone; Dan Fava: trumpet, flugelhorn; Jeff Lynn: trumpet, flugelhorn; Walt Beveridge: trumpet, flugelhorn; Sandy Hughes: trombone; Ron Wetzel: trombone; Will Betts: trombone; Kevin Grant: bass trombone; James Wrubel: piano; Greg Reginato: guitar; Karl Hartmann: bass; Paul Yonemura: drums.